"Obama The Story": The hidden GOP talking points in the new David Maraniss book. 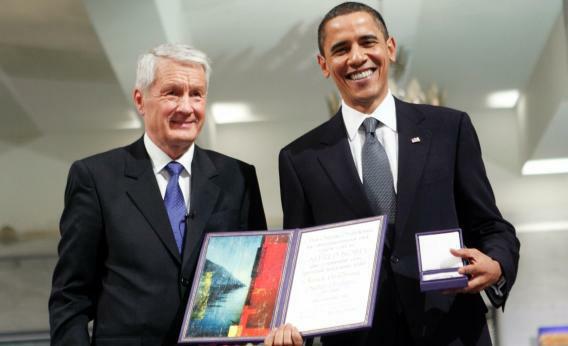 Barack Obama gets a Nobel Peace prize in 2009 for all of his accomplishments as U.S. president. The greatest personal revelations in David Maraniss’s Barack Obama: The Story, about Obama’s youthful drug use and romantic dalliances, have already been comprehensively excerpted. But as Andrew Sullivan notes, even these exaggerations are kind of boring. It also seems unlikely that anyone is going to be able to make political hay out of the hyperbole of a 17-year-old memoir when the American people’s personal views of Obama are already so well-established. There are plenty of minor stories from the book, however, that seem very much to confirm the biggest anti-Obama clichés. As a favor to conservative talking heads and GOP apparatchiks, I’ve collected these anecdotes. For convenience’s sake, I’ve stripped out as much context as possible to leave you with hopefully the purest evidence for your unadulterated talking points. You’re welcome! … Obama had concocted a desperate plan. Their lease was to expire on December 7, but rather than pick it up themselves (they were subletting), he suggested they let it run out, not pay the last month’s rent, and stay until they were evicted or found another place. The fancy cars, the exquisitely outfitted people, the snooty airs, it all overwhelmed Obama… The polo and disco scene left Obama feeling dispirited… “Everything is bought and sold, with unconscious satisfaction. From discothèques to the Finals of the Southeast Asia Games polo match,” [Obama wrote]. [His bookshelf contained] Reveille for Radicals by Saul Alinsky. This leads to the characteristic that was most problematic for Obama as an organizer, a tendency that would crop up again and again later in his career: his caution.